Bring a classic ambience into your bathroom with the upscale Ashburn 30 inch W x 21.63 inch D vanity cabinet. The white finish is clean and sleek, offering a vanity that is more affordable than it first appears. Vanity include two cabinet doors with soft-stop bumpers with plenty of storage space within. Check out the rest of the Ashburn collection for matching items like wall cabinets and mirrors. This 60 console-style vanity from the Gazette Collection has an alluring blend of traditional and modern influences. The vanity features a lower storage shelf, four slow closing doors, and two drawers with self slow-closing drawer glides & dovetail const Also available in store by special order only see store for details. The Naples 30 inch vanity provides an unexpectedly vast storage space, behind 1 beautiful door and 3 full-extension, dovetail drawers. Perfect for stacks of towels and a wide array of bath items you want nearby. Constructed with natural poplar wood, this sturdy cabinet is treated with an Antique Walnut finish for an elegant look. 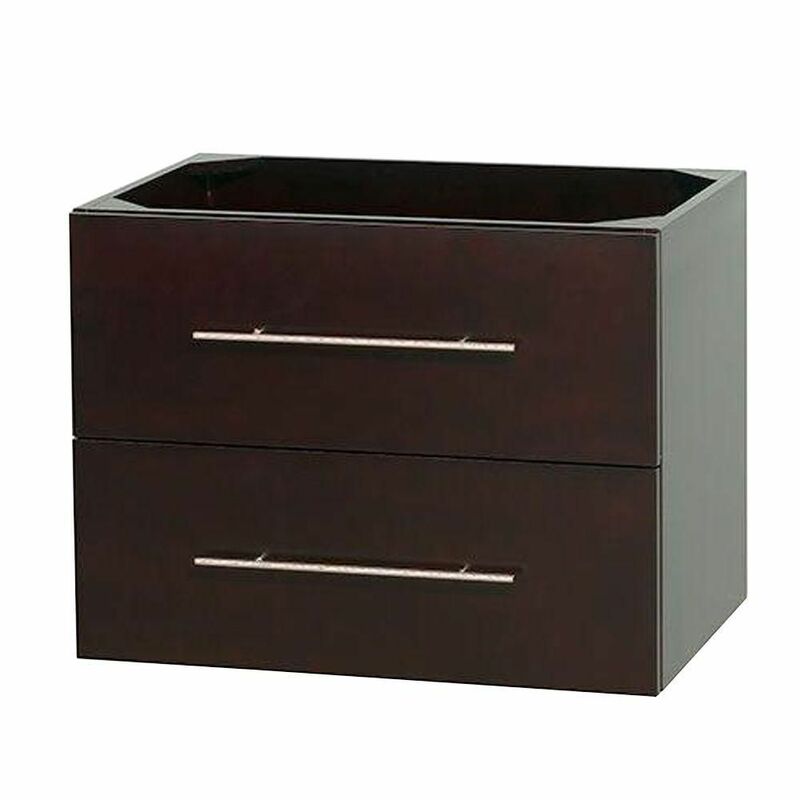 Centra 30-Inch Vanity Cabinet in Espresso Simplicity and elegance combine in the perfect lines of the Centra vanity by the Wyndham Collection<sup></sup>. If cutting-edge contemporary design is your style then the Centra vanity is for you - modern, chic and built to last a lifetime. Featuring soft close door hinges, drawer glides, and meticulously finished with brushed chrome hardware. The attention to detail on this beautiful vanity is second to none. Available in several sizes and colors.